Human rights champion and queer saint Pauli Murray is a renowned civil rights pioneer, feminist, author, lawyer and the first black woman ordained as an Episcopal priest. Her feast day is today (July 1). Murray was arrested and jailed for refusing to sit in the back of a segregated bus in Virginia in 1938 -- 15 years before Rosa Parks became a national symbol for resisting bus segregation. In 1941 she organized restaurant sit-downs in the nation’s capital -- 20 years before the famous Greensboro sit-ins. She was attracted to women and her longest relationships were with women, so she is justifiably considered a lesbian. But she also described herself as a man trapped in a woman’s body and took hormone treatments in her 20s and 30s, so she might even be called transgender man today. Murray was approved for trial inclusion in the Episcopal Church’s book of saints, “Holy Women, Holy Men” in a 2012 vote. Usually the Episcopalians wait until 50 years after a person has died before making granting sainthood, but for Murray the church set aside the rule and approved “trial use” of materials commemorating her now. Others have written extensively about her many accomplishments, but material on Murray’s sexuality is hard to find. She did not speak publicly about her sexual orientation or gender identity issues, but she left ample evidence of these struggles in her letters and personal writings. Murray’s queer side is discussed in many books, including American Eugenics: Race, Queer Anatomy, and the Science of Nationalism by Nancy Ordover and To Believe in Women: What Lesbians Have Done For America by Lillian Faderman, and in the play “To Buy the Sun: The Challenge of Pauli Murray” by Lynden Harris. A graduate of New York’s Hunter College, Murray was rejected from the University of North Carolina UNC Chapel Hill’s graduate school in 1938 because of her race. She became a civil rights activist. In the late 1930s Murray was also seeking psychological help and testosterone implants from doctors in an effort to “treat” her homosexuality by becoming more male. Eager to become a civil rights lawyer, Murray was the only woman in her law school class at Howard University in Washington, DC. She graduated first in her class in 1944, but was rejected by Harvard because of her gender -- even though President Franklin Roosevelt wrote a letter of support for her after Murray contacted First Lady Eleanor Roosevelt. Instead Murray studied law at the University of California in Berkeley. She wrote numerous influential publications, and NAACP used her arguments in the landmark 1954 Brown v. Board of Education case that ended racial segregation in U.S. public schools. Her ongoing frienship with Roosevelt is described in the 2016 book, “The Firebrand and the First Lady: Portrait of a Friendship: Pauli Murray, Eleanor Roosevelt, and the Struggle for Social Justice” by women's studies professor Patricia Bell-Scott. In the early 1960s President John Kennedy appointed Murray to the Commission on the Status of Women Committee. She worked with Martin Luther King Jr. and Bayard Rustin on civil rights -- and criticized the 1963 March on Washington at the time for excluding women from leadership. In 1965 she became the first African American to receive a law doctorate from Yale. A year later she co-founded the National Organization for Women. Instead of retiring, Murray launched a new career at age 62. She entered New York’s General Theological Seminary in 1973, before the Episcopal Church allowed women priests. She was ordained in 1977. She celebrated her first Holy Eucharist at the Chapel of the Cross in Chapel Hill, NC -- the same church where her grandmother, a slave, was baptized. After a lifetime as a human rights activist, she drew on her own experience to preach a powerful vision of God’s justice. It can be difficult to locate Murray’s sermons in books. Eight of Murray’s sermons can be found in the readily available book “Daughters of Thunder: Black Women Preachers and Their Sermons, 1850-1979,” edited by Bettye Collier-Thomas. Sermons by Murray in the book are Male and Female He Created Them (1978), Women Seeking Admission to Holy Orders as Crucifers Carrying the Cross (1974), Mary Has Chosen the Best Part (1977), The Holy Spirit (1977), The Gift of the Holy Spirit (1977), The Dilemma of the Minority Christian (1974), Salvation and Liberation (1979), and Can These Bones Live Again (1978). It was my destiny to be the descendant of slave owners as well as slaves, to be of mixed ancestry, to be biologically and psychologically integrated in a world where the separation of the races was upheld by the Supreme Court of the United States as the fundamental law of our Southland. 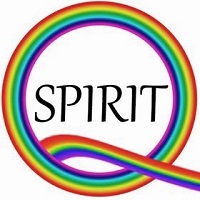 My entire life’s quest has been for spiritual integration, and this quest has led me ultimately to Christ, in whom there is no East or West, no North or South, no Black or White, no Red or Yellow, no Jew or Gentile, no Islam or Buddhist, no Baptist, Methodist, Episcopalian, or Roman Catholic, no Male or Female. There is no Black Christ, no White Christ, no Red Christ – although these images may have transitory cultural value. There is only Christ, the Spirit of Love. Murray died of cancer on July 1, 1985 at age 74. Her best known book is Proud Shoes: The Story of an American Family (1956), her memoir of growing up as a mixed-race person in the segregated South. 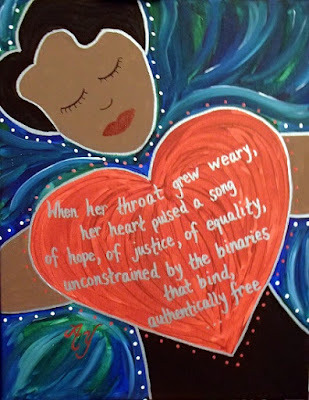 The image of Pauli Murray at the top of this post is part of the “In the Spirit of Those Who Led the Way” series by North Carolina artist Laurel Green. She creates digital artworks in conversation with more traditional media. For more info on Yarber, see my previous post "Artist paints holy lesbians and other women." 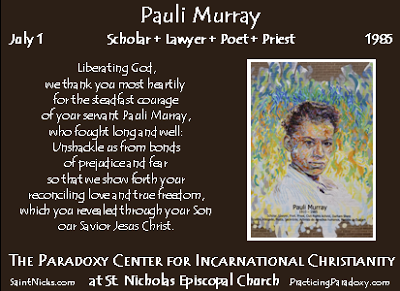 Liberating God, we thank you most heartily for the steadfast courage of your servant Pauli Murray, who fought long and well: Unshackle us from bonds of prejudice and fear so that we show forth your reconciling love and true freedom, which you revealed through your Son and Our Savior Jesus Christ. Pauli Murray image from Holy Women, Holy Men on Facebook celebrating saints in the Episcopal Church, produced by the Paradoxy Center at St. Nicholas Church. Thanks so much for this very interesting post. I admit - somewhat to my amazement, given my involvement with the African American community over the years - of never having heard of this remarkable person. I have ordered the memoir cited in the blog. Trudie, I had heard vaguely of Pauli Murray, but I was amazed and fascinated when I began to research her life. She is a real genius and a civil rights pioneer WAY ahead of her time! I can hardly believe how she has been ignored, considering how influential she was on the national stage. Putting her together with Bayard Rustin, it looks like black gays and lesbians were on the forefront of the movement for racial justice in America. I also ordered a couple of her books yesterday (from the library). I love the way she describes herself as an integrated person in a segregated world. She seemed to be making a reference to black/white racial issues, but I think she also experienced this in terms of the male/female split. She didn’t fit either category; she integrated both male and female. The book ”American Eugenics: Race, Queer Anatomy, and the Science of Nationalism” makes the point that she (and the rest of her generation) was able to fight and win against racism and sexism, but still gave up her power to the medical establishment, letting doctors tell her that her homosexual attractions were a sickness to be treated. 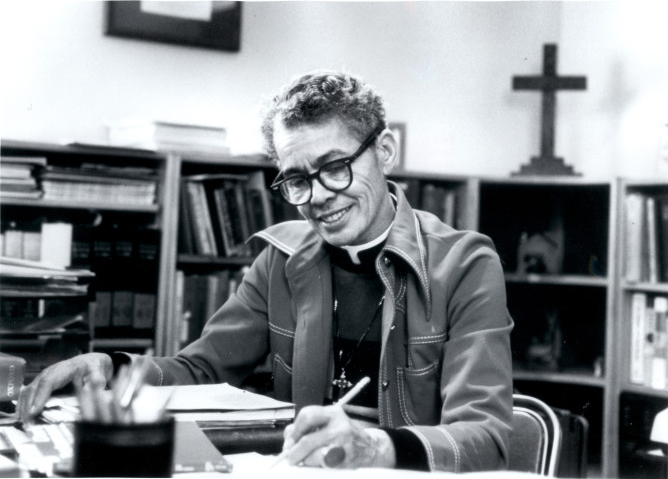 I haven't heard any more news about the vote on Pauli Murray at the Episcopal convention. What a great post about Pauli Murray. I am involved with the Pauli Murray Project in Durham, NC where we are trying to share her story with more people, promote dialogue in our community as a way of continuing her work and we are renovating her childhood home. We were thrilled last night when the Episcopal General Convention voted to make her a saint. We'd love to keep up with others who believe in her vision of wholeness and justice. You can find out more about our work at www.paulimurrayproject.org. Barbara, that’s wonderful news that yesterday’s vote approved “Saint Pauli” to be included in the Episcopal book of saints. I went ahead and updated this post with the latest info on the vote. Thanks for letting me know. I found a lot of valuable info at your website www.paulimurrayproject.org while I was researching this article, including your comments there affirming Pauli’s lesbian identity. I was a little disappointed that her queer side did not seem to be mentioned anywhere on the official site contents, though. 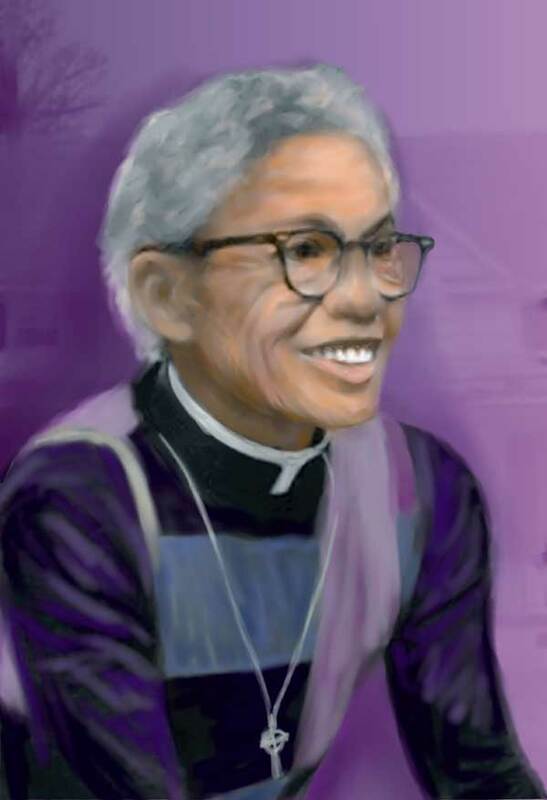 I was excited to see the murals and other portraits of Pauli Murray on your website. This blog emphasizes LGBT spirituality and the arts, so I like to run artist’s portraits of saints with their profiles whenever possible. I hope that we can work together on this for her first “saint day” next July 1.